The return to San Felipe was not very pleasant. Through Carabobo I could see the mark of Acosta Carlez changing everything from uniforms to park names. One would think that there are more urgent issues than changing the name of Valencia main public park, but apparently not. San Felipe welcomed me with the return of the "buhoneros" in the main shopping streets. Under authorization of Gimenez, the new governor, who made a mess of his own township before being sent to the top office thanks to Chavez and his vote buying tactics. After 4 years of having been the only state capital free of the informal street vendors plague, Gimenez had to rule over the San Felipe mayor to bring back to San Felipe that scourge. But I suppose that when you have garbage in your mind, you like to have garbage in the streets. In barely two months two of Chavez governors have already demonstrated clearly that their style is crappy and authoritarian. Woe is us! And I will pass on that item in El Nacional yesterday where Miraflores Palace is setting up a "command post to monitor by Internet" the work of the governors. Good bye decentralization! It is official. One characteristic of fascist or proto-fascist regimes is their vulgarity, be it in ideas (for lack of a better word) or administration or urban matters. The only thing that counts is to erase the memory of those that were in office before, of destroying anything that might be looked as even slightly positive. Why? One reason is that they know that they are very incompetent and very undemocratic and thus the need to erase any point of reference. Though on occasion mythical references are called upon to give some sense of direction. Even if that past was far from being a model. Think Valhalla, the Roman Empire or Simon Bolivar. This last one is probably tossing back and forth in his grave as is name is invoked in vain! Meanwhile, although with a slight cold which will limit my year end activities, I wish all of you a happy new year and good partying tonight if that is what you are inclined to do. And I wish you plenty of energy to undertake the long road to recovery of our democracy. We will need all of our energies! 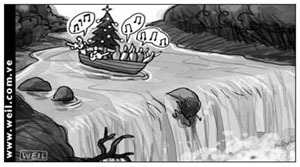 Be it the tsunami disaster in Asia that keeps us in constantly renewed horror as more videos arrive, as the death toll spirals up, or our more mundane spiraling political violence that keeps unabated through the holidays, there is little to cheer this end of December. I even wonder if Chavez is not pushing this latest round while the world is busy looking elsewhere. I have noticed that not even cable TV is safe from this onslaught as the government is littering with paying adds the main cable channels (such as Warner or Sony). Until when for the cadenas to be mandatory for cable? I will wait for my return to San Felipe to catch up this week end. Suffice to say now that it is revenge time in Venezuela, from the two year wait to finally sue unjustly the oil workers, to invading land for no real other purpose for the chavista officials to force it sale, cheap, and probably to the same chavistas through the usual testaferros (pseudo owners). To close this brief post, I wanted to mention the death of Susan Sontag, the brilliant intellectual liberal writer of "Illness as Metaphor" or more recently "The Volcano Lover". I find it strange that Sontag died during the Tsunami that devastated an area rich in volcanoes. I wonder what she would have thought of the whole mess, made worse by the pro-tourist developed coasts whose environmental implications are only starting to surface. The life Susan Sontag lived was not one of an elitist icon, but of an ideal of democratic meritocracy. I think that people will understand if I am not too concerned tonight by the latest Venezuelan news, mesmerized as I am by the Indian Ocean tsunamiS. Let's think for a while to what might be the biggest natural disaster that we will see in our life time. I am also mesmerized by the turn of events in the Ukrainian elections where the previous "result" has basically flipped over, the previous "loser" winning by close the number of the previous "winner". I wonder what would be the result on August 15 if the election were run the way they should have been run, with adequate international supervision. The more days pass the more I think that Chavez did lose and that Carter bailed him out, afraid of the blackmail of disrupting oil supply to the US. If you think that I am crazy look at the new loser of the Ukraine: he has sworn never to accept the result of an election where he does not win. Fascists are the same, in the snow or in the tropics. As a consequence of all of these customs, extensive days off, and vacations requirement for workers, many business started to set their annual vacation for 2 to 3 weeks around Christmas. Early January has become a big vacation time. Caracas loses between 10 and 20% of its inhabitants as people go to visit relatives or go on vacation. Between Christmas and New Year at least half of the country is not at work. Even the president used to retire for a few days to one of the presidential lodges such as Orchila Island or Kavanayen. Even some papers stopped printing for a few days and TV became boring as most anchorman and TV shows took a break, leaving their Christmas special taped long in advance. In other words the country goes off for about a month with its peak inactivity in the early days of January. But this year things have changed. Political activity took place until the 24 as new political arrests were ordered. 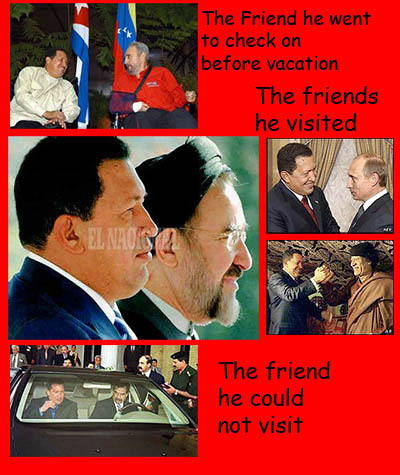 And Chavez left for a China trip, during Christmas. That is right, Hugo Chavez, the president of the bolivarian republic was in Beijing or whereabouts on Christmas days signing business deals, offering China more oil than for the US and ranting over the one China policy dismissing democratic Taiwan and speculating freely that Mao and Bolivar would have been good friends. Quite a few presents there for human right abuse prone regime of China. Is there a meaning to this? More than likely. Besides trying to become the most anti US leader around, Chavez wants to leave HIS mark wherever he can. And why should not be our Christmas customs a target for the bolivarian glorious revolution in its attempt at creating the new Venezuelan man? Let's have a look at the evidence. Chavez is not a religious person. Nominally a Roman Catholic he has embraced the Venezuelan evangelical movement who mostly supports him (3). He has fought real hard with the catholic church. He has worn all sorts of religious ornaments from our Native Americans. He is known to be superstitious and well versed in our local lore (4). If he talks of a multipolar world, some of the pseudo intellectuals that try to build an ideological construct for him are trying to promote our connection to Islam as being as important as the ones we have with Christendom. Forgetting that whatever connection we have with Islam comes through Spain Islamic period that ended in 1492, the year Columbus landed in America. Some signs of that pro Islam bent are unequivocal (as a reaction to the US as the main "Christian country"?). The newly elected governor of Anzoategui, Tarek Saab has been denied an US visa for its link with some Islamic sectors. Fraudulent Venezuelan passports have been seized by US customs. Other links to Islamic groups have been reported. Chavez has consistently courted the Islamic states, in particular the non democratic ones of Algeria, Lybia, Iran and even Saddam's Iraq (though their membership in O.P.E.C. is reason enough to visit them). And let's not forget the recent raid on the Hebraica social club of Caracas WHILE Chavez was visiting Iran a couple of weeks ago. (1) Stuffed corn dough wrapped in banana tree leaves, baked ham sometime with pineapple, Hen based salad, Ham bread, Green papaya sweets. Hallaca has three main variants: Andes, Central, Oriental. (2) All in all, Christmas and related activities last from mid November (La Chiquinquira in Maracaibo), to the first week of February, (La Candelaria). In Maracaibo Christmas trees and lights are up for at least 2 full months. (3) Chavez tone and exacerbated rhetoric resembles more the fire and brimstone preaching of your local Pentecostal preacher than a "normal" political speech. (4) Consulting an astrologer or a witch doctor in Venezuelan political circles is not looked down. 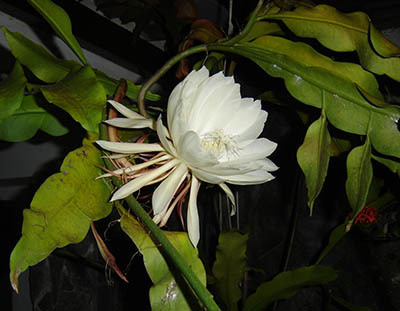 When we finished our Christmas gathering around 2 AM, we were greeted with this extraordinary flower. It comes from a plant relative to the cacti family (I have not been able to check the real name yet but I am working on it). A huge white flower (12 inches?) 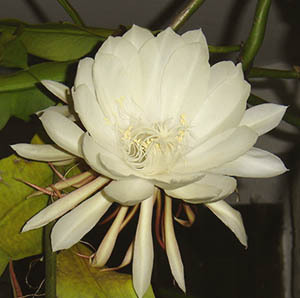 blooms for only one night, fully opening at around midnight. And Christmas eve was the night! What looks like leaves are not leaves, it is the plant itself. There was a time when you could even stop buying papers a few days before Christmas, when even the president would go on vacation for a very few days. But now, never any peace...... A long week end is coming and I will try to catch up. Meanwhile my best wishes for the readers of this blog and let us all give ourselves a deserved little break. The head of the Central Bank of Venezuela, Maza Zavala, is talking of about 14% GDP increase over a 9% decrease in 2003. He is not talking of the decrease in 2002. He is not talking that we are still below 1998 in spite of sky high oil prices. He is not talking about the only 1% drop in the jobless rate in spite of a 14% GDP increase. He is not drawing the conclusion that this 14% is only reactivation and very little new grow, and not even a full recovery. We will see the 2005 results, as private investment is still coming drop wise, and only on efficiency, not job creation. That is right, in the middle of a civil war the Colombian economy keeps seeing investments and growth while its trade balance improves to the point of becoming a problem as the local currency increases 17% against the US dollar, making exports too expensive. Meanwhile across the border the Venezuelan Bolivar went from 1600 in February 2003 to an announced 2150 in the next couple of months, with currency control and a 14% GDP growth. That would be, say, a 30% drop to the dollar. And a near 50% drop to the Peso? I think one does not need to be a rocket scientist to figure out that the Colombian economy is better managed than the Venezuelan one. Congressional hearings in 2005 on these issues would be an eye-opener. As opposed to the Chavez regime, the U.S. Congress looks at facts before coming to a conclusion. The Chavez regime can present its case for which it has no facts, only political conclusions that satisfy its anti-American prejudices. The result is going to be a big surprise for the Chavez regime, which is accustomed to a rubber-stamp national assembly and pliant supreme court to obey their boss. 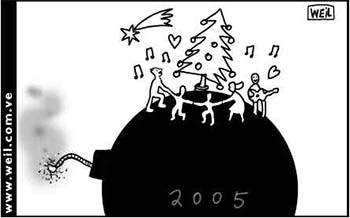 After his pessimistic Christmas cartoon, Weil does an even more pessimistic New Year cartoon. Yep! No reason to be optimistic! Sunday night I was working on a post on Chavez foreign policy, mentioning among other things the ridiculous proposal of UNASUR. 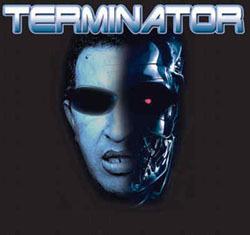 This with the perfect picture for random diplomatic violence, our new tropical Terminator. The translation of one choice paragraph at the end. Latin America has been generating mechanisms of political and economical articulation(Group of Rio, Central American Common Market, Mercosur, ACN, Andean Parliament, Latino American Parliament, all sort of summits) that little by little, and with a few contradictions, have been strengthening the regional profile for its better insertion in the global village; and to be able to face with the outmost political and economical efficiency the challenge meant by being so far from God and so close from the United States (1). What Chavez proposes, in this case, seems to have been suggested by George W. Bush himself. For the gringos nothing would be better than that for the latinoamerican conuco to remain wide open to the ALCA river without any dike (2,&3). Operation "Trojan Horse" could be named the Chavez proposition in the coded language of the CIA. (1) allusion to the famous words from Mexico as to why all of its problems: we are so far from God ands o close to the United States. (2) ALCA is the acronym for the free trade intitiative proposed by the US to transform all of the Americas in a single barrier free market. (3) "conuco" is the subsistence farming plot carved directly from the jungle in Venezuela, preferably close to a stream of water to facilitate some irrigation. It has become the pejorative symbol of an archaic mind "conuquero" or very rudimentary technology, of course open to any flood that can easily sweep the harvest away. The Danilo Anderson murder saga continues. I know I didn't want to write on this anymore until something really new would take place, but today bizarre event cannot be ignored. In the first days after the bombing of Danilo Anderson car, one of Caracas municipal council member, Carlos Herrera declared that Danilo Anderson was getting pressure from some people within the Chavez administration so as not to inculpate some of the folks in the 400+ list of the Carmona decree signataries. Presumably some folks doing fat business with the government (remember, money does not stink). I did not pay much attention because in today Venezuela it is difficult to believe, and even less to trust anyone. But Carlos Herrera who claims to be one of Anderson's best friends persisted even though the vice president Jose Vicente Rangel said that Herrera's words were "garbage". This was rather novel, I must say. Days went by and suddenly this week end Isaias Rodriguez, the Nation's General Prosecutor decided that indeed one should pay attention to what Carlos Herrera was saying. Duh! In an investigation of the importance of Anderson's assassination, all leads should be followed!!! But I suppose that it is better late than never. So we have a few interesting possible speculations tonight. Does Herrera really knows something? Did they arrest/cited/stopped him or not? Did they stop him to buy him out? To intimidate him? Is this some big somke screen while they have some one else fall? To distract while they look for the real guilty party? Is Herrera a decoy from the real murderers? Will C.S.I. next season inaugurate a CSI Caracas annex? Foreign policy considerations do not need to be very complicated. If one were to consider foreign policy as based on the type of alliances and trade deals that are supposed to guarantee a maximum of safety for one country, and a maximum of prosperity for its inhabitants, Venezuela natural and principal partnership would be with the United States, with essential side links toward Colombia, the Caribbean and to a lesser extent the rest of South America. Europe would be a purveyor of luxuries and Asia of electronics. Why? As the geographically closest supplier of oil after Mexico and Canada, Venezuela could negotiate tightly with the US to get a good deal on other import-export matters besides barrels of oil. Colombia is the only neighbor with whom we can trade easily and its agricultural vocation suits Venezuela who is less gifted on this respect. The Caribbean is the Venezuelan mare nostrum. We can supply it with tourists and feed stuff so they can buy our gas and energy with what the other tourists bring. All of these with minimum transportation costs, a common language (English is spoken by all business people). Now, before I criticize Chavez foreign policy I must say that this very simplified scenario was never seriously considered. Past governments were only too happy to bicker with Colombia when the internal situation was tense. The US was never considered a potential partner but rather a wanna-be colonial power, who too often gave the natives reasons to be weary. But what Chavez is doing now makes no sense for Venezuela. It might not even make sense for him. Relations with Colombia have been tense since he reached office and the only reason they keep going on is simply because it is too important a source of feed stuff for Venezuela, because there is a too long a tradition of textile and manufactured goods imports that Venezuela is just unable to produce for the time being. Relations with the US are strictly based on sending oil there faithfully so that the US does not look too much Venezuela's side while Chavez does his revolution. Right now the government makes every possible effort to find new clients even if costs are higher. And any supplier different from the US is more than welcome. The Caribbean is a mess. Oil is used to browbeat any country that is not supporting Chavez adventures, in an aggressive role unheard of from Venezuela since democracy came in 1958. Venezuela is behaving worse than an Empirelet there. Cuba has become the tutelary agent of Chavez and thus Venezuela foreign policy is pretty much aligned with Castro's wishes. Chavez has inaugurated an all out offensive into the South American circles. It looks more like the proverbial elephant in the China shop. Until a few months ago, saddled with a difficult referendum, Chavez could not exert as much muscle as he wanted, trying instead to sign up for any possible concession that would bring good photo-op for domestic usage. When not lambasting the US at any opportunity. That anti US stance became a main pillar of the referendum campaign although probably no more than a few thousand thought of that when they cast their vote. Chavez last affront was to ask people that have been working for years patiently to establish an economic union between non complementary economies to throw away everything and create UNASUR. That is right, all the advances that Mercosur has realized, all the slow process of the Andean Community which is extensively sabotaged by Venezuela, in particular since Chavez came into office, are to be passed over and leave room for an immediate political union. That should come first according to Chavez, regardless of whether people want it or if it is even feasible. Not only this reveals the inner contempt that Chavez has for his colleagues in the Western Hemisphere and their work, but it reveals his own deep seated ignorance on how the world moves. NAFTA and EU came to be only after people decided that it would bring a betterment of their daily lives. It keeps existing and expanding because most people do detect improvements. No matter what, it is always a slow and heavily criticized progress. But why is Chavez following such an obnoxious and brazen foreign policy whose sole aim seems to piss off the United States? Using the excuse of creating a multipolar world is only that, an excuse. Even if the United states wanted to control the whole world it would be impossible, and at any rate it would not last long. No Empire has survived the test of time though its culture might. And US culture, if we can call McDonald and rap culture, has already won the battle. Pretending that chavismo foreign policy corresponds to a grand leftist design for the victory of the Venezuelan Revolution and the protection of the country from invasions is another chimera. That foreign policy is carried by hoping around in a luxurious airplane bringing along a claque, and financing all sorts of local entities to make sure adoring crowds and local pols welcome Chavez. No, any design is for the glory of the leader of the revolution. The fine analysis by Julio Cesar Pineda realistically looks at all the advantages that Chavez has now, whether ill acquired or by sheer luck. It clearly demonstrates that a pragmatic foreign policy could greatly enhance Venezuela's influence. And indeed some steps have been taken such as changing foreign minister. But all these efforts are always in great danger as an irrepressible Chavez one day signs ALBA with Cuba's Castro just to spite the US it seems; and almost the next blurts out UNASUR. Since August 15 Venezuela is too small for Chavez. He has trashed everyone inside and now he must seek glory outside. Narcissistic personalities are very predictable. As long as he is in office Chavez will always revert to his favorite role: trouble maker, just like his mentor Castro, a glamorous international personality that ultimately is used by all and achieves nothing. No Christmas spirit this year again. The third in a row. I think people are starting to get used to it. Only one apartment in my building did put some lights out. A little plastic tree in the hall way and that is all. The blessing is that with the lack of enthusiasm, and money, the usual petards exploding at any time of day, or night, have decreased to almost nothing, at least in San Felipe. As usual the country is pretty much shutting down except for food stores and present stores. These last ones will be closed by the 24 at noon and the country will be lethargic until the second week of January. Only resort areas will show some activity, perhaps as much as usual due to the fact that less people can afford to travel overseas for the holiday. But less people can afford to travel too. So local tourism has not improved much. Still, people are organizing their family gathering, a few toys are been bought, some discrete decorations are finally appearing. This cartoon of Weil expresses quite well the prevalent mood. With the repressive laws voted, or about to be voted, it is quite clear that next year things will be different. A few do celebrate Christmas. Perhaps some chavistas that did hit the jackpot and do not realize that they will eventually be affected. Perhaps a few NiNi of early this year that are unaware of reality. But I can assure you that most people from the opposition that I know and who are cognizant are limiting themselves to a family gathering with little extravaganza. They are not on that boat, even if part of society might be embarked on it. As for myself, in a few days I will be leaving for Caracas. There in between family obligations I will concentrate on a backlog of books to read. Thus I expect less blogging as of the middle of next week, not to mention that politically I think that not much will happen. Chavistas have grabbed everything and I suppose that now they will rest. I do have a few things to get out before I leave. Thus you can keep visiting until you go off on holiday yourselves. As the list of Human Rights abuses in Venezuela remains without serious State investigation, Teodoro Petkoff in today's Tal Cual editorial revisits an issue that is still causing many problems. Namely, the odium seen against those who dared call for a Recall Election which, if indeed Chavez won by 60%, should be instead a cause of celebration and reconciliation for the country. All the pettiness and misery of chavismo could hardly be better encapsulated than through this symbolic issue. My translation. The first picture is from the cover of Tal Cual showing representative Luis Tacon, one of th emost loathsome members of the chavista machinery. And the end of article the Weil cartoon of today. How much longer with the Tascon list! A few days ago we celebrated Human Rights Day. On this occasion [Vice President] Jose Vicente Rangel made a speech where he affirmed, among other gross exaggerations, that under this administration nobody had never been tortured and that never, never, were Human Rights violated. Of course, when Rangel speaks of torture he only thinks of tortured politicians. The systematic torture applied by the police corps to the common delinquents, this one, it seems, is not torture; that one does not make noise nor does it perturb the vice president’s sleep. Now, since Rangel states that this administration has never violated Human Rights, it would be quite enlightening to look at the famous, for its (bad) reputation, “Tascon list”. Can there be something, in addition of low, despicable, vile, ignoble and coward, that would attempt more Human Rights than the elaboration of a list where the names that figure in it are condemned to a political and labor apartheid? This list has been used and is used to fire uncounted numbers of public employees who signed to petition for the Recall Election. This one was also used and is used to deny or delay the emission of ID cards and Venezuelan passports for those who signed the petition. Who ever is in it does not exist for the state. Does this violate or does not violate Human Rights? That list has been used and is used to negate contracts or commercial transactions with the State to numerous businesses. Does this violate or does not violate Human Rights? To sign for the convocation of a Recall Election is a right established in the constitution. Why, thus, should one who exerts that right be punished through the denegation of that most basic Human Right that is the right to work? Putting aside the physical torment, it is difficult to imagine another aggression to Human Beings as hard as depriving one’s way to earn a living just because of a political opinion. No matter if this takes place as a delayed sanction, or through the humiliation caused by the self imposed inhibition to exert one’s rights because of the fear of losing one’s job. This, Rangel, how would it have been qualified by that journalist who became famous and appreciated for denouncing violations of Human Rights in a not too distant past? This cartoon refers to a project announced this week for a new National ID card that would include a micro chip. Translation: 1) Please Mrs, your smart card [note the red beret, chavismo symbol] and 2) Sorry, but we cannot help you [note the Firmo, signed up]. This is actually not a joke. And New Year in jail? Emboldened by a now servile judicial system where some thugs found a job, William Lara decided to sue for slander Tulio Alvarez. The reason? Tulio Alvarez asked for an investigation to be opened against William Lara when eh was the chair of the National Assembly. The motive was some illegal budgetary arrangements within the National Assembly. As an immediate consequence Mr. Alvarez is not allowed to leave the country until the trial date. Instead of investigating something which 1) would have been reasonably easy to investigate and 2) which was obviously of crucial importance, the powers that be filed up the suit somewhere into oblivion. Now that William Lara knows that no High Court ruling will go against him, he can move on with a slander suit, regardless of whether Mr. Alvarez was right or not. After all now any investigation on that subject will find a lily white Lara, of this we are all sure in Venezuela. So why bother waiting for that investigation when you can already slam the messenger? Yep, this is the way fascism operates, shoot the messenger. And if you doubt this you can read the Teodoro Petkoff Tal Cual Editorial of yesterday. But why go suddenly so strongly against Tulio Alvarez? Well, among many activities to expose the moral misery and corruption of the ruling class, he is the one that wrapped up the damming electoral fraud report on August 15. This report is slowly making its way into foreign countries's foreign offices and even if these countries are not planning any action on Venezuela, the discredit of Chavez in their minds will become a given with time. The best and simple (and simpleton?) strategy is to jail Tulio Alvarez on some minor detail. Just as the Nazi started jailing Jews. Just as Stalin started his purges. You left office with a State pencil that you forgot to put down and you ended up in the Gulag. Meanwhile Mr. Alvarez is very cool and even declares he will avoid to go to the High Court as there is nothing to look for there if you want justice. Surely a new law suit against him for slander? He seems that he will be enjoying Christmas. I wonder if the newly appointed thugs will, knowing that the country as such contempt for them... But I suppose that thugs are used to that. The web has been enriched with a new site, Noticiero Digital, which carries many of the articles from the different Venezuelan media, in particular many from sites with restricted access. I think that it will be of great help for Venezuelan bloggers, no matter what language they write in. Let's just hope that the press will understand the need in the web, in the difficult times that are coming, to have a beacon of information, and let Noticiero publish freely. Some people do get it. The Miami Herald editorial show that at least in Miami people are very aware of the Venezuelan "legal" dictatorship. Although the registration is free, for people that do not want to be bothered the full text below. Beware what you wish for: Six years ago, disgusted with a corrupt political system, a large majority of Venezuelans ushered Hugo Chávez into power with license to conduct his ''Bolivarian revolution.'' Today, the nation stands at the brink of being an elected dictatorship. With new pro-Chávez justices packed onto the Supreme Court, a new law that gags the largely opposition press, a pro-Chávez majority in the National Assembly and broad executive powers to rule by decree, its hard to imagine that any Venezuelan institution can check the president's reach. Chavistas ask, What's wrong with that? Mr. Chávez promises to spread the wealth of an oil-rich country that has an embarrassing amount of poverty -- and he's already spent lavishly on social programs for the poor. The problem is that limitless power leads to limitless abuses. Without watchdogs such as the press and judiciary, a president can stifle dissent, discriminate against minorities, send enemies to jail, award fat contracts to cronies, take kickbacks, use the treasury as a personal piggy bank and impose policies that are not in the interest of the greater good. In the end, the poor end up worse off. And such a president could be reelected for life. The result of absolute power can be seen just north of Venezuela, in Cuba. Ruled by Fidel Castro for 45 years, the island's economy has been destroyed and its people stripped of fundamental rights. Publicly challenging the one-party system can land a Cuban in jail, as it did 75 dissidents imprisoned last year with terms of up to 28 years. It's not reassuring that Mr. Chávez looks to Castro, a dictator, as his mentor. Nor are we encouraged that one of the newly appointed Chavista justices to the Supreme Court recently suggested that Venezuela's current constitution -- written to Mr. Chávez's own specifications -- should be amended to allow the president to be reelected indefinitely. Other disturbing signs point to the Mr. Chávez's relentless consolidation of power. The recently enacted Chavista gag law gives the government broad discretion to fine and shut down media outlets that until now have given voice to Mr. Chávez's critics. The measure outlaws messages deemed to ''disrupt public order'' and other offenses so vaguely defined that anything might be considered a crime. A new penal code just approved by the pro-Chávez Assembly even criminalizes the cacerolazo, a popular protest method of banging on pots and pans. Venezuela's opposition remains divided and weak after Mr. Chávez defeated the attempt to recall him from office, and other watchdog groups are under threat of prosecution. No one remains to stop his rule. The consolation is that Mr. Chávez will be the only one to blame when the country fails to prosper. It looks like Santa did indeed bring Chavez what he wanted, his very own personal judicial system! He must have been a good boy! For the rest of us, a lump of judicial coal. Tulio Alvarez of the electoral fraud fame among others, submitted last June a legal action to the High Court, TSJ. The objective was to suspend application of the new judicial power law that is from any point of view, even this humble blogger perspective, unconstitutional. According to Venezuelan law the TSJ should have replied to him either to tell him to go to hell, or to accept it to examine the argumentation offered. But as it so happens these days in Venezuela where everything that is annoying to the chavista powerful is stashed away until kingdom comes, Tulio Alvarez justified request was simply received and ignored. Now, as the law has been applied it will be for the new illegally named judges to decide, someday, what to do about the Alvarez request. Thus Tulio Alvarez did the only honorable thing: yesterday he withdrew his legal suit. A clear symbol so that we all know that we have no business to go to the High Court if we seek justice and repair. This simple story, just as the new justices will be sworn in today, illustrates the moral corruption that will be endorsed by the Venezuelan judicial system, if we can even call it by that name. There is already enough written in English so that the reader can make his/her own opinion as to what this blogger is writing about. But in May, President Chavez signed a court-packing law that allowed his governing coalition in the legislature to obtain an overwhelming majority of seats on the countrys highest court. The 17 new justices (and 32 reserves) were selected yesterday by a simply majority vote of the governing coalition, which did not reveal the names of the nominees to the opposition members of Congress until the time of the vote. According to the opposition deputies, ruling party MVR refused to disclose the names of the candidates because not even Chavez' supporters had reached a consensus on the matter. In fact, the list was handed over hand written and right before the names were announced to the session. Most selected judges were not appointed to the TSJ chambers they had been assigned to by a Citizens' Power's committee evaluating the candidates. One of the most serious consequences of this confiscation of yet another branch of government will be the loss of confidence, objectivity and impartiality of the administration of justice in Venezuela, already sorely battered. The government now has in its hands the legal instrument it needs to endorse the bills proposed by the revolution and to neutralize dissidence of any kind and from any source, without there being any counterbalance whatsoever to pose limitations on its actions. The government will have no doubts from now on, since without scruples the one in charge of ensuring safe nominations [Pedro Carreño] declared that all "have a filial link to the revolution guaranteed". Let's recognize the sincerity of the confession, which was unnecessary if truth be told, but the regime does not even care about appearance. [snip] Thus, no one should hold any doubt: Justice, as the General Prosecutor [Isaias Rodriguez] stated "is either revolutionary or it is not justice"
Monday we had the French sub secretary for foreign affairs visit the Venezuelan vice president, Jose Vicente Rangel. Business between France and Venezuela has been brisk since Chavez made it to office. According to Monsieur Renaud Muselier French investments have multiplied by 12 between 1997 and 2003. Thousand of jobs have been created as a consequence. That might be but one cannot help to notice the 1997 date when Chavez rule started on February 2 1999. A way to improve the numbers and make the Chavez administration look good? The reader might think that I am again being overly critical but I will reply by citing further declarations of Monsieur Muselier. Some of them are actually translated into English by El Universal. [Monsieur] Muselier called his meeting with Rangel "satisfactory and fruitful." "I have greeted and congratulated Venezuelan Vice President for he is a man who respects democracy. I would also like to seize the opportunity for congratulating the Venezuelan people for the latest events in this country," he added. With two sentences Monsieur Muselier validates a vice president who is behind too many of the irregularities experienced in this country in the past 5 years, and sweeps away all the electoral irregularities and human rights abuses that have been extensively reported just this year. These, he would not tolerate for a second in Europe, but perhaps for its French African colonies. Oops! I meant ex-Colonies such as the Ivory Coast. Now, let's be clear about something. France needs to sell its wares. And the international competition is stiff. Considering France top heavy social laws it probably tries to farm out jobs as much as it can to sustain an expensive welfare state that it is unwilling to reform. In this respect Chirac's administration is basically a populist one, very clumsy when it tries to promote a few ineffectual reforms. To protect himself from the left attacks he has found convenient to bolster cheap anti US stances, De Gaulle style . But he is no De Gaulle. But did Monsieur Muselier need to add that last part? Does he read the papers? The answer is no, of course. That is the job of the French embassy which prepares such visits and advises its superiors on what is convenient to say. Responsibility for this statement is strictly due to the personnel of the French embassy in Caracas who has shown once too many its partiality towards the chavista regime. Monsieur Muselier job is to be nice to the guys in place and try to get some juicy contracts for French oil interests quite in trouble in the Middle East. Meanwhile the British Minister for Latino American Affairs, Bill Rammell also visited the vice president. Business matters also, we all need to expand markets. But at least Mr. Rammell had the good taste to worry aloud about the recently passed "gag" law. Two countries, two diplomacies. There is a final tidbit to nail the coffin of French diplomacy, if it can be charitably called so. El Universal also reports these words from Monsieur Muselier. The French visitor underlined that Venezuela is a country respectful of the environment and "clear proof of it is that Venezuela is the first oil producing country that just ratified the Kyoto protocol, which is an example and a signal for the world"
Oh boy! Could one take this and run!?! I will stay away of the Kyoto discussion. However Venezuela is a massive violator of its own environment. French embassy personnel are known for liking to travel around the country. They certainly know the myriad of environmental problems that Venezuela has from incredibly polluting cars, to extensive deforestation, to the near dead Maracaibo lake not to mention that half of our beaches get direct sewer hits. And they know of the blissful disregard for these problems by the authorities, starting with the central government, only prodded into action when the scandal is visible from a satellite (think Maracaibo Lake). Whoever inserted that in the information dossier of Monsieur Muselier made him look like a fool and should get fired on the spot. As I write, France is once again the laughing stock of Venezuelan thinking class, probably even the chavista portion. But France has long shorn defense of democracy and moral values in the world for its petty mercantile interest. Very fitting as this month France commemorates 200 years of the coronation of Napoleon as emperor, the dictator that bled France, Europe and along the way postponed democracy for 70 years. Venezuela News and Views has won its category! With 36.3% of the votes. Time for a short victory speech. Thanks to all those who voted of course. I know that many of us made that effort to represent through this blog all the Venezuelan blogs that try to bring to the world a different view of Venezuela, to tell what is going on here really: The Devil's excrement and Vcrisis in particular who have not faltered, even after the somber night of August 15. If they had not continued I do not know if I would still be writing. Thanks also to VenezuelaToday for providing the best collection of links to Venezuela and facilitating the research that has to be done to write so extensively. All Venezuelan bloggers should be very indebted to this portal who is UNIQUE in offering all links from both sides of the divide. Even if we were the least voted of all the categories, it is a start and let's hope that this will help promote ALL of our blogs outside of Venezuela, and entice more bloggers to join the good fight. We need all what we can to counter the official disinformation that the Chavez regime distributes, when not outwardly helped by certain newspapers who gobble the trash. I would like to point one in particular: The New York Times whose twisting of facts on Venezuela has left more than one wondering about what else the NYT is twisting. With the new restrictions to information that are being installed in Venezuela, blogs are sure to become an important source of real information. And perhaps destined to make history. All non Venezuelans that are still reading these lines, remember, you read it here first. Today the National Assembly named the new members of the TSJ, our High Court, based on the new law voted a few months ago. At least the opposition had the delicacy to step out of the assembly when the vote took place. It is fair to say that today is a dark day in Venezuelan history. By packing the TSJ with 17 political appointees, the Government ensures that his already clear majority in the present Court will be a large one, a commanding one in every single of the different court halls that comprise the TSJ. In this new travesty of justice, if you want to have a chance to get at least a fair hearing you better show that you like Chavez. If a foreign company wants to invest in Venezuela, it better have chavista partner if it gets involved in some suit. And so on. If some reader thinks that I am exaggerating, it is enough to look at some of the newly appointees. The reader could start by looking at the video clip from today session, as shown on Globovision news. Some of the candidates were sitting at a honor balcony. When the vote was officially cast they stood up cheering. One of them even brandished the fist high on, and start hitting his chest rhythmically to let make sure were his partial ideology rested. Yes, this man will be one of the new fair and impartial judges of the Republic. The reader could also look at the names of those appointed to the Constitutional Hall, who in violation of the constitution has decided to become the main court of the TSJ, walking into other courts business as it wishes. Two names hurt the eyes when read. Carrasquero of Cosa Nostra Electoral fame, the one that allowed the electoral system in Venezuela to become a farce, the one that would have annulled all the signatures for the referendum if it had been up to him, the one that spat on the face of democracy, is now in the Constitutional Hall. He will be in good company as another one that climbed up there is the morally deficient Velazquez Alvaray, the one that already came up with a constitutional revision proposal after the "victory" of Chavez of August 15, proposing that the constitution should be changed to allow Chavez to run as many times as he pleases. The cruelly funny part of all of this masquerade is the mechanism of the election, to call it by a name. Normally three consults should have been done where a 2/3 majority was needed. Then if it failed a 4th round would be called and there a simple majority vote would have sufficed. Thus chavismo was assured to name whomever it pleased. But that was not enough. In the anti democratic streak that now characterizes the majority MVR managed to go through the previous three loops without revealing who were in their final short list. The final list of 17 new judges and more than 2 dozen substitutes was revealed ONLY today, thus making a final mockery of the whole process. I just let the reader ponder the nomination process of a Supreme Court Justice in the United States and compare it with the blatant manipulation experimented in Venezuela. Then again in the US justice is taken seriously. Thus we had a president who was elected in large part to resolve the judicial mess of Venezuela. In 6 years he made it worse, replacing the infamous "judicial tribes" by a single pro Chavez camarilla whose qualifications are very questionable to say the least. This is the offical end of the separation of powers in Venezuela, a day that shall livein infamy, to paraphrase a commemoration a few days ago. Well, it seems that I have won though it is not official yet. They are checking for ballot stuffing. It has been detected in most categories, and even this blog was a victim as 100 votes were stricken a couple of days ago. I do appreciate that some folks love this blog so much that they are willing to cheat on my behalf, but please, next time spare us the embarassment, or do not get caught :-) Or maybe it was chavistas trying to discredit me? In this land of magical realism all is possible! However there is one sour note. The category was the least voted of all, even with the mild cheating that we witnessed. Blogging in English seems to still be a rather US activity (and Australia as they trashed the UK in total votes) and a conservative one, if we are to judge by the results in other categories. Though I am sure that over time diversity will increase. Manual Caballero tries his hand at humor by rewriting Venezuelan history according to the tastes of the powers that are. I found a delightful snippet that I will make sure to use in the future. Referring to the Electoral Board of Venezuela, CNE (Consejo Nacional Electoral) Caballero calls it Cosa Nostra Electoral. I propose that as an exercise we give an equivalent from the God Father movies to any of the principals of the Cosa Nostra Electoral. I will send it to Mr. Caballero. So it is up to you, vote for whoever you want but vote. Ps: some have not understood the little screen. You read the numbers and letters (capital letters) in the rectangle and type them in the square above 'submit' , and press submit. It is a security system and you will not get junk mail or nothing! It seems that in Venezuela some people are weary of giving ANY information. Must be a sequel of the Reafirmazo! 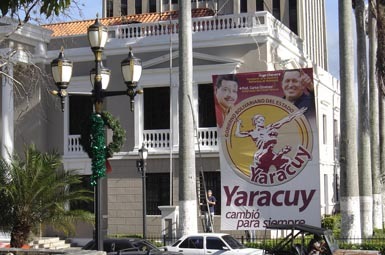 This title could have sounded optimistic considering that now Yaracuy will have a new governor. But with barely a month in office, I am not too optimistic. Indeed some changes are taking place. In spite of claims of bankruptcy, mismanagement, deficient services (standard in Venezuela when we change administration but nobody ever goes to jail) funds have been found to put yesterday this glorious and expensive poster. First things first! Thus when you visit the State Capitol you will know without the shade of a doubt that Yaracuy has now a "bolivarian" government and that the one in charge is Chavez via HIS governor. Note that the colors used are the ones of PODEMOS; technically the governors party instead of the flaming red of Chavez party. This red is already found in all the T-shirts of public employees of the highway that crosses Carabobo. There, within a few days of Acosta Carles taking office, all the T-shirts of the employees went from yellow to the brightest of reds with a logo of "gobierno bolivariano de Carabobo". Toll stations are now colorful. I wonder how long will Gimenez be allowed to keep his colors. I worry for him. This little advertisement appeared early this week in El Yaracuyano, one of the two local papers. In it you can read that the insurance cooperative (¿?) UNO is opening an agency in San Felipe. Just in time for the new administration? Now, there is nothing wrong with a new insurance option in Yaracuy, the good Lord knows that we need all the insurance we can get in Venezuela! But strangely it comes as a cooperative organization which is one of the battle horse of the "new solidarity economy", or some other PC expression. I can see cooperatives for milk producers, coffee growers or school supplies. But insurance? Does not that require some significant capital? However the reader could say that this blogger is overly critical and skeptic. So I will retort that the real problem in the picture is the director shown on the right and photo shop enhanced: ex banker Orlando Castro, who acquired quite a reputation during the banking collapse that Venezuela experienced in the first half of the 90ies. You can make a google search for the man figuring in this picture and you will not be disappointed. Interestingly Mr. Castro came back from "exile" once chavismo was solidly in place and has joined the revolution. As did other luminaries of the financial past who now are making a social come back as seen in the social sections of newspapers recounting the parties thrown by members of the new revolutionary elite. The inside page of Tal Cual is worth reproducing. Chavez said early in his term that "buhoneros" (street vendors) had to be left alone. As such they provided some of the downtown troops that Chavez need on hand at any given time. Further, some of the spaces that had been recovered by the city where deliberately surrendered again to buhoneros, in spite of all the considerable financial and human effort to recover at least some key areas. Not to mention that doing such a thing at Christmas shopping time is a crass error! Buhoneros are certainly victims of unemployment, but then again the government has not improved anything on that front and, besides, that is no excuse to take hostage the whole downtown area. As I have already written: deals made with Chavez are ALWAYS bad deals. PS: Bernal, one of Caracas mayors, Barreto the Mayor at large. Thus the three B are the Bane of Caracas. Pictures of Caracas downtown rioting are popping around. No matter what, things will get reported. This morning RCTV was showing at 8 AM (censored time) the images that they supposedly showed yesterday (I could not verify that). I do not know if RCTV is throwing a gauntlet to the new law (RCTV is target nunber 1 in chavismo effort at muzzling the media) but this morning in La Entrevista they were clearly relishing the moment. It would make sense for RCTV to seek a judicial challenge as soon as possible. After all, one thing is certain, the government will try to shut down at least one media as a warning. No matter what, the street rioting yesterday between chavista supporters and chavista police is certainly the kind of things that chavismo does not want to air. Now that the opposition has been fraudulently eliminated, these type of things will be more likely to happen. The rioting AND the censorship. OK. My worthy opponent is making a strong effort with cute pictures to get votes. I cannot follow such a strategy and I can only be jealous of the wit he shows. However, there is an argument that I can advance. The category of South American blogs is last, in the list and in the total vote numbers collected. So, get moving and vote. If you hate my blog and come here only to be able to curse, that is fine, vote for the other guys, but vote!!!! We must make sure that Latin, Caribbean and South American blogs is not last, or at least a honorable last. And of course by winning, it will be a win for ALL Venezuelan blogs in English as all active blogs endorsed me, very, very generously. Trouble downtown Caracas, "gag" law in action on its first day. The chronic problem of informal street vending in Caracas has reached a new height today. But fear not, the escalation is just starting. A few disgruntled street vendors were chased away by Caracas Police, namely Libertador district under the ineffable Bernal. Assuming this role is a novelty for a Police more known for its expertise at hampering opposition marches. I suppose that with no more opposition marches they have to find something to justify their paycheck as crime seems not to be their main preoccupation. Street vendors of course got very upset and in the grand tradition of Venezuelan protests they decided to burn some public transportation. This is not the time to discuss the informal street vendor problem in Venezuela. Suffice to say that downtown Caracas has been taken over by a sea of stands that occupy and destroy most sidewalks. From the mouth of the vendors themselves it seems that there are all sorts of mafias that charge for spots, protection, pseudo-"taxes" and what not. Classical exploitation of the powerless applied by this government as it has always been applied in the past. And probably directed from some obscure corner of townhall who by its tolerance admits its role. No, what should attract our attention is that this happens in the first day of the "gag law" and no images of the downtown violence has been shown. Actually, I turned on TV at a quarter to 6 whengot home and I only learned on Globovision about the trouble at 7:15, which made me check things out and write this post. If I want to see images of the event I will have to wait for 11 PM. Or edited images earlier. But how do you edit a burning bus and people throwing stones from behind? PS: 25 were hurt and at least one is dead, on the latest news. So, we are talking significant disturbance, worthy of coverage. So that is it, Chavez signed into law the National Assembly repressive instructions voted yesterday while the opposition representatives were wearing a black gag on the debate floor. I really do not care for what defenders of that law say: its objective is clear for all of us. Objective one is to avoid most criticism of a government during the hours of maximum TV and radio audience. During these hours some of the distasteful actions from the government when it does unpalatable activities such as some we saw in the recent days for the investigations of the Anderson case, will have to be only alluded to. No graphic language, and images even less, will be allowed before 11 PM. The sanctions previewed and the people that will be in charge to decide on these sanctions certify that in practice a self censorship will become the rule. Otherwise, the excessive sanctions will certify that networks will go bankrupt. Why that? Well, more unpalatable actions are on the way. On a longer objective, by promoting "local talent" that will have to "register and be approved" by the government, it certifies that in the long run we will have a more monochromatic TV. That is right, you will have to watch stuff prepared by people approved by the government. The stuff will not be censored directly but indirectly. The perfect crime? "We are going to put an end to fascism in private media"
I wonder if he realizes how fascist is that language. Well, this is the mood in the thinking sectors of Venezuela. On the other side the silence is deafening as chavista (ex) journalists not only do not pay attention to what is going on but are busily voting a law that will limit media coverage to civil rights abuse. It is fascinating to see a once intellectual, free thinking class of people, journalists, writers, protesters of old days, surrender to El Supremo first and then start collaborating, sometimes even enthusiastically as they probably hope to be appointed somewhere. Thus starts fascism. Déjà vu all over again. The article from Michael Rowan is not to be missed. If government investigators believed there was potential evidence relating to the horrific car bombing that killed Danilo Anderson in a school, there was a perfectly effective way to look for it -go over to the school at 5PM when the students are gone, and tell the school administration to stand aside while you look around. But that's not what they did. Instead, a phalanx of government police raided the place, like heavily armed marines attacking a nest of terrorists bunkered in a school in Iraq, and at the early morning hour when 1,500 students and hundreds of faculty and parents were arriving to begin a day of learning. Well, a lot was learned that day, indeed. The fact that it was a Jewish school is lost on no one. This was an unmistakable message to the Jewish community, which has heard that loathsome message many times before. Early on, the Nazis used this tactic against the Jews to strike fear in their hearts, as it did. The whole world knows what came after that. In the Soviet Union, Jews were subjected to similar harbingers of their persecution. Targeting Jews served the purposes of ideological and racist fanatics since the diaspora, the expulsion of Jews from Palestine thousands of years ago. It starts with symbolic attacks on Jews as outsiders in the communities they have lived in for generations, and communicates the ethnic cleansing the authorities may have in mind. The people of Europe and North America are especially sensitive to this symbolism, because they remember the holocaust and the gulag first hand, as does every Jew who survived thereafter. World wars have been fought over this issue, and may still. In Venezuela, the Jewish community has disappeared into the fabric of the society, as it has all over the world. Yet it is astonishing to Jews learn that they are not French, not American, not Mexican, not Venezuelan, not Russian -they are always and only Jews. No matter how many generations a Jewish family may have lived in Venezuela, this one incident triggers the fear that once again, they may be targeted as different, despicable, squalid, putrid, filthy maggots. In the deafening silence from the government following this symbolic event, everyone in the community, Christians, Muslims, Buddhists, and those with mixed ethnic or religious background, must stand up to the authorities, and say with one voice: I am a Jew. We are all Jews. This blogger declares himself now a Jew. We are now millions of Jews in Venezuela. Two things rather scary for our democratic future in Venezuela, assuming that we are still in democracy, have happened last week. I have commented on the Hebraica raid, that time when the Jewish social center and school of Caracas was raided at the hour at which kids go to school, of all times. Well, things are not going too well for the government as voices are rising to demand an explanation, of course not convincingly forthcoming, as usual. And it went further in asking Mercosur to delay the entry of Venezuela until all of this affair is cleared up. To make sure that the message arrives, in case the Venezuelan authorities do not know who the Wiesenthal Center is, the communiqué comes in Spanish. One thing is certain, Jewish people do not need anymore to be told twice. The newly elected government of Mr. Saca in El Salvador might have made a political blunder from which it will have a hard time to recover from. On April 11, 2002 the two police commanders of Caracas Metropolitan Police, Forero and Vivas, had quite a lot of work to do. Since then chavismo has been trying to put the blame on people killed that day on the Metropolitana, Peña and his employees as Caracas Mayor at large. Indeed it is not to be surprising, even if these two people are absolutely innocent, that they have decided to seek asylum in the Salvador Embassy. Simply put, there is no way they can get a fair trial. The opposition understands it quite well and chavismo too by speaking of revenge and not of justice, at a time where Chavez is rewriting history, in the grand tradition of all the authoritarian regimes that ever existed. Read Aporrea and you will know what I am talking about. The innocence or guilt of Forero and Vivas has long ceased to be the point. El Salvador government of course knows all of this quite well. Then, why did they refuse to grant asylum when they did so for Molina Tamayo who is probably more guilty of wrongdoings on April 2002 than almost anyone else? Is it that they want their ex-president Flores to become the new OAS secretary? Was that what they will get for handing Forero and Vivas to chavismo? Apparently it is not for oil as Salvador mostly buys his oil in Ecuador. Not to mention that Castro hates Salvador, and Flores, and thus Chavez surely does not carry them in his heart... Or is it that Salvador who has the most right wing government in Latin America prefers to stay quiet at a time when people like Chavez are more than willing to fund destabilizing factors in the region? Money talks, even from pseudo leftist governments. Whatever it is I predict that in the long run el Salvador will realize that negotiating with Chavez is ALWAYS a bad deal. Mr. Saca will find out sooner than later. PS: I was forwarded a letter written by Roman Duque Corredor, one of the most prominent Venezuelan jurists. In that letter to the Salvadoran Government, there is a detailed explanation of all the legal problems that the mishandling of the situation has caused. I have posted it here. He also had time to graciously plug a vote line for this blog. Thanks Miguel, any vote I get is a vote for you too. At least this is the way I feel. It is amazing what one can do on a rainy Sunday afternoon. Reading El Universal I fell on a table detailing the financial requirements presented to the National Assembly in order to maintain Barrio Adentro, the controversial Cuban MD program to establish health care in poorer areas of the country. The table published in El Universal (that does not appear in the web) details the number of MD per state for Barrio Adentro. These MD origin is not specified (but there are at least 80% from Cuba, last I heard something). And I suppose, and there I might be wrong, that the funds requested are to maintain existing programs as I have not heard any special announcement to the effect of new programs. The yellow line is the national average, and the pro Chavez and opposition averages are indicated by color matched arrows. The averages are calculated, of course, by adding all doctors and all voters, not just the average per state! The national average does not include Amazonas, the least populated state for which the CNE does not give numbers. I think that the result is striking! If these are indeed numbers reflecting the MD situation on August 15 then one must wonder why there were more MD per capita in opposition states than in pro Chavez states!!!! One would be that indeed the MD Barrio Adentro were a cover for some other type of activities that I will let the reader speculate on. In fact, independent observers had reported that Carabobo, Miranda and Yaracuy were states where medical care could be considered ABOVE the national average, in particular Carabobo. And these three states were also the ones most desired by Chavez. A study of some of the incongruousness sustain this. Delta Amacuro is arguably the most economically backward state and thus a relatively high number of MD is a given. But Caracas Downtown area has much less MD per capita than Miranda which includes a large portion of Caracas suburbs. Anzoategui and Monagas are the lowest opposition states, but they also have a significant oil industry structure that the government might have used in addition of Barrio Adentro as the newly hired oil workers could use other services than Barrio Adentro. Why Tachira is a third of Carabobo beats me. The large presence of the Army as it is a border state and thus uses Plan Bolivar 2000 instead of Barrio Adentro? All of this are only hypothesis, of course, and all might be perfectly wrong if the numbers presented are the plans to bring light to liberated states! But then why is Zulia so high? PS: I will even send them my Excel sheet if some investigative journalist wants to pick the challenge! The other day I was writing about bloggers jailed in Iran. Now we have a Venezuelan web site accused of terrorism. Yes, indeed, Alek can be quite loud on occasion and even says things he should not be saying. I even wrote him so, that some of the stuff he writes hurts his cause. Not to mention that he is certainly not any louder than some of the ones that grace the pages of Aporrea. On the other hand he is very clearly identified, has attended all sorts of meetings, rallies and what not, and was even one of the organizers of the Recall Vote in the London Venezuelan embassy. A terrorist with a mask he is not. He is very easy to pluck and probably too broke to even buy a pound of cheap fireworks for Christmas. PS: added later. If you want to see a catalogue of state sponsored actions that could pass on occasion for terrorism, read this, in English. These are the real stuff and the press is starting not to buy anymore some of the Danilo Anderson stories that we are fed with. But then again soon they will be accused of being "terrorist press". I am running late in coverage considering all that is happening. I wanted to put the previous post on Thursday but this and that happens and time runs when one is having fun. There is one sure thing with Chavez: never a dull moment. So I'll start with a quick hit and run on some Op-Ed, in no particular order of importance except for the last one, the most important. So the Ukrainian Supreme Court has ruled that the election has to be redone, and that new safeguards must be installed. Quite a demonstration of people’s power! In Venezuela we are still waiting for the opposition leaders to either pursue their fraud strategy of August 15 or at least have the decency to recognize that Chavez won, even if not fair and square. But AD has remained strangely silent after its October rout and all are letting Primero Justicia defend alone its embattled mayors. Well, at least for the Wall Street Journal the evidence of electoral fraud in August is now out of question. I wonder if Carter will dig deeper his hole by responding once again to Anastasia. His letter of three months ago looks now quite pathetic in light of what has happened since his crew sloppy job has allowed the installation of the first XXI century autocracy. What a fall from glory for Carter! All his work in the last two decades will have floundered on Caracas. To think that in June I still thought the world of him; but I should have known better, too many cozy meetings with Chavez already. To confirm the debacle of electoral objectives, Fausto Maso Saturday in El Nacional is rather pessimist when he titles his OpEd "Ostriches do not win elections". Quite matter of fact he reminds the opposition that in January it must be hitting the streets for the legislative campaign. And that this time they really will have to campaign hard, that they will have no help from local authorities and that Chavez will have even more power for campaign abuse. Thus unless they settle their differences, make a common strategy to annul the unfair electoral system pernicious effects, the chavista majority will go from 51% to 85% and "without opposition Chavez will abuse his power, will approve laws by [just] sending them through Internet". Direst prediction of legislative servility rarely sounded more true. As everybody and their brother seem to want to put their hand on Venezuelan oil production (and nothing else, by the way), Gustavo Coronel muses on the impending financial collapse coming to Venezuela. Any observant observer, and forgive the tautology, should wonder how come a government that is receiving zillions of dollars through a quirk of history, who has vanquished, literally, any opposition to its plans, is blithely announcing a devaluation with date and all, even if it was to cancel the date the next day, not the devaluation. That mind game on an 11% devaluation while new bonds are issued can only be interpreted as elevating to State policy insider trading. But management of the economy? After 6 years they still have no idea on how to run the country. For the record, in February 2003 the rate exchange was fixed at 1600 for the US dollar. Sometime in January it will be fixed at 2150. This is a drop of 34% in TWO years, while supposedly the flow of dollars was controlled. Well, someone seems to be able to take dollars out of the country. To finish this section on financial mess, I invite you to read Miguel's post on the new mortgage regulations, the purchase of expensive and useless fighter jets and funny bond issues. And then you can wonder why anyone would want to invest in Venezuela. As if all these news were not already depressing enough, we must add the must-read of Carlos Blanco article "With the Star of David on my Lapel". In this extremely strong and unambiguous article Carlos Blanco withers any possible official explanation to the Hebraica raid a few days ago. I must say, with all responsibility that I was perhaps the first one to mention the "coincidence" of Chavez in Iran and the raid, but such is the advantage of blogging over the press and the media: speed. But if my thoughts then could have seem exaggerated for some, by now it scares me to read that others are way ahead in condemning that raid, a totally useless raid which is still not explained by the authorities. I translate the closing paragraph of Mr. Blanco's article. That this red light be of use for all of those who fight for freedom; when a Jew is attacked for being such, we enter in a zone of total and absolute risk for the free thinking and existence of all, Jews and non Jews alike. Do not believe the official apologies, they are part of the same set up. As a reader commented a couple of days ago: Jews are the canary in the social mine. Long time readers of this blog will surely recall that in addition of the constant violations of basic political rights that I denounce, I have also added such things as the latent homophobia within chavismo. Thus, do not ask me why I agree with Mr. Blanco that all of this was planned: the pattern is here for all to see, or are willing to see. I am writing to you who are gathered in this august assembly in the Teresa Carreño. The Encounter Between Artists and Intellectuals has been receiving a mild coverage in the press, if not a sarcastic one, but this is probably due to the fact that they have not realized that you were invited by more than the Cuban government. These insensitive weirdoes should remember that poor Fidel is sick, and probably sick of having to receive you regularly in Varadero, amen of catering to you: jineteras are there for dollar paying tourists! No! Fortunately El Supremo the other night set the record straight by saying that it was a CUBANOvenezuelan initiative. You were all with him that night, gawking at the new anti US knight in fashionable suit, when he announced that you were all in cadena. And you all cheered in triumph as El Supremo announced that you were in Cadena. 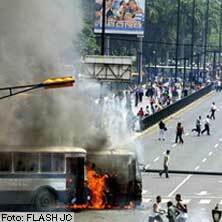 Not your first time in Venezuela, isn’t it? You have learned about our little Supremo media practices, practices that Eva or Ignacio would not tolerate a single second from their local supremitos. I mention these guests since Chavez called on them during the cadena, I mean, his welcome speech. This was quite a cadena, was it not? He told you all about his recent vacation visiting all of his pals. Some are not too happy and got quite a hangover. Moratinos comes to mind. Other did not get a hangover but then again their religion forbids them to drink. Unfortunately the format of the speech did not allow for pictures of his vacation. Do not worry, here you have the pics of Chavez with some of his friends, all known people lovers, humanity saviors (well, at least they are known for saving their own humanity, that must count for something). No prize for naming all of his friends. How long was the cadena? I do not know, I bailed out before the end. After all, you know, I have heard what he says hundreds of time now. It is always the same speech, all about ME! The Victim! But I did hear that Chavez wanted you to work hard and have a good time. He was very worried by you producing a significant document to crown this hallowed reunion. But considering the season I am sure that you will write something worthy of the remains of a Christmas bazaar. The other thing he was worried about is you having a good time. I will help my president here! I like our guests to have a good time. Unfortunately the beaches of Vargas are still a mess 5 years after the wash out. Varadero it ain’t… but worry not, I have a list of alternate activities. For the serious minded ones around you, you need only walk within a mile of the Teresa Carreño to see a perfect inventory of all of Human Misery that you are here to rescue us from. Street kids, pushers, prostitutes, thieves, peddlers all inhabit this “post-nuclear” landscape that Caracas has become, according to Ms. Socorro. But Chavez in his magnanimity has allowed Bernal to be re-elected mayor so he will have a chance to demonstrate that things can be kept as you see them, like a reference point for progress elsewhere, a museum of sorts of the effects of neo-liberalism. For those that want to have fun and travel I can suggest our own version of “Where is Waldo?”: “where is Silvino?”. If we are to believe El Supremo underlings, his buddies disguised as security forces took him away over a month ago for some real partying. No one has heard from him since. Now, that is a heck of a hangover! Though he called from Valencia his sister, or so she thinks. But nothing else. Thus as you visit our beautiful country look around! Fun! If you come to my home state of Yaracuy do not miss the Sorte mountain and the cult of Maria Lionza. There among other magical activities you can probably practice spiritism and calling the dead. You might find there our state prosecutors and top detectives trying to call the people shot in the Anderson investigation before they had a chance to declare. Worry not, this is a practice that existed before Chavez came to power, shoot suspects first, interrogate after. You know how El Supremo respects traditions, in particular when convenient to him. And of course you can visit one of numerous cyber cafés where you can write your loved ones at home. Soon these will be hotbeds of information as the "gag law" will limit real time transmissions of news. Next time you come you might not see that café again. While writing your squeeze sweet nothings, you can also vote to nominate El Surpremo to the Nobel Peace Prize. A given considering all the peace he has brought to Venezuela. All in all have a good stay. Just stay clear from the Colombian border, from the mountains around Barquisimeto, in the streets after sunset, away from Maracaibo lake (unless you plan to go to the Delaware River area which is full of Venezuelan oil). Well, now that I think of it, you are better off staying in your hotel unless a native ferries you around. Trust me on that one. For some strange reason this blog has been nominated for the “Best Latino, Caribbean and South American blog”. I am surprised that I made the cut for a recognition that I did not even know existed. I was even more surprised that Miguel, or Alek were not in the list (other good Venezuelan blogs are in Spanish and thus cannot qualify, I suspect). Having been working so assiduously on this blog for so long is in large part due to their example as they started before I did and kept going on strong. They should be ahead of me in any contest. But so it is and this page is the one running. Considering how much Venezuela needs exposure let’s be happy that at least one of us made the cut. In the run, there seems to be only two blogs properly from South America. Two are from the Caribbean, and the rest seem to be written from the US. Whether you want to vote for this blog (after all it does promote Venezuela even if not all agree on this kind of promotion), you can still visit the site and check the nominees as it will be a review of so many interesting blogs around the world, in so many different categories. A fun experience by itself. You also get to vote once a day (they seem to control better their voting system than the Venezuelan CNE where some folks seem to vote several times a day). And if you dislike this blog you can still go and vote for the other guys to make sure they beat me, though you will find that I am probably one of the most liberal ones listed there! After all being anti Chavez does not mean, contrary to popular belief, that one is a conservative: we come from all sides but we are all real democrats, suffering from allergies to any autocrat that crosses our path. Thus you can vote here, everyday if you please, until December 12.